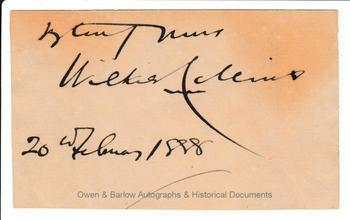 WILKIE COLLINS Autograph Presentation Signature. English novelist. Author of 'The Woman in White', 'The Moonstone', etc. A good, large autograph signature on heavy paper piece. With the sentiment "Very truly yours" and the date "20th February 1888" in his hand. This appears to be a presentation signature purposely provided, rather than a fragment extracted from a letter or other document. 11 x 7 cms (4.5 x 2.75 inches). Slight browning to top right corner, some mounting traces to verso. Very good.